By Sajio George in Artwork. Updated on February 18, 2019 . A business card is the quintessential business networking tool and will help your prospective clients find their way back to you long after you have sparked up a conversation with them at a local meet-up. Traditionally business cards tend to be boring, bland, and used as more of a pre-requisite than a chance to impress – but not these creative and innovative business card designs. If you want to build up contacts and stand out of the crowd, you need business cards that can impress like these 20 examples can. 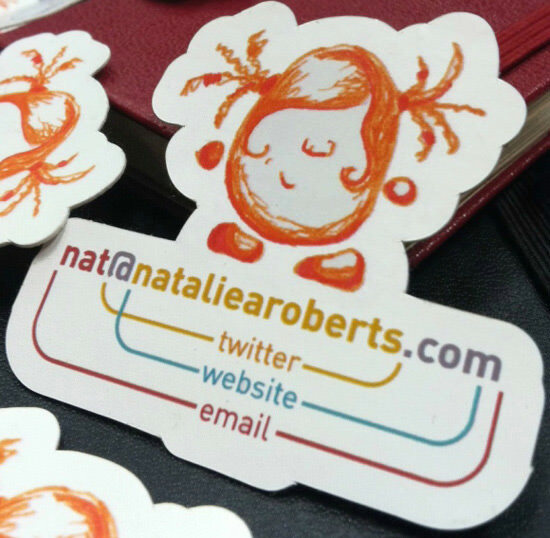 Designing Business Card That Rocks! Formerly known as TAM Express, TAM Cargo is a cargo airline based in Brazil that operates within Latin America and between Brazil and the United States. Their business card can be changed into a nice little cargo box. The idea behind the design comes from Y&R. 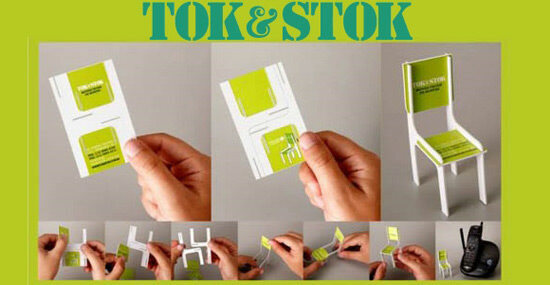 Tok&Stok deals in the manufacturing of self-assembly furniture. Their creative business card can be transformed into a little self-assembly chair. What a way to catch the client’s attention. It’s designed by DDB. 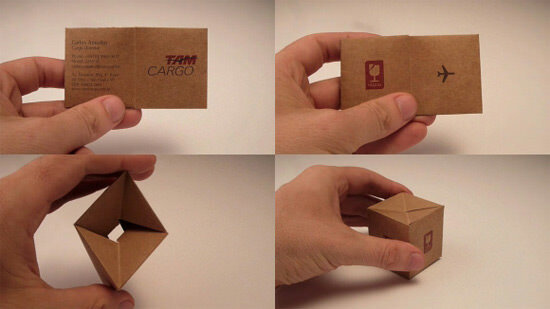 A rather simple foldable business card for a furniture business. Designed by Amanda Casabella. A visiting card template that looks like a travel tag that you can use for your travel agency business or as a personal visiting card for a travel blogger. 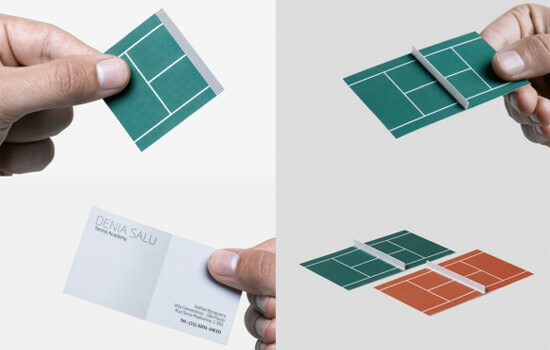 This tennis court business card that works really well for a tennis academy business is the product of a collaboration with Publicis. It comes in both grass and clay courts!! An Austrian experimental music duo worked with Katharina Hölzl to come up with this work of art that also acts as their visiting card. 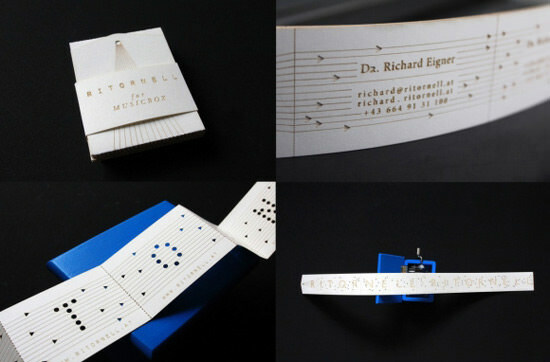 Their contact information was cut onto a long musicbox paper stripe that also contains nine micro compositions consisting of circles and triangles. Bon Vivant is a cheese store in Brazil. 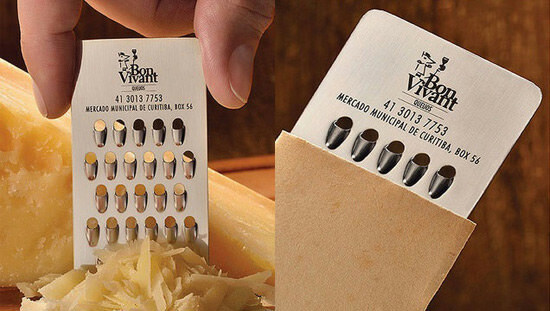 They hired the folks from JWT to create this grate business card. It doubles as a cheese grater – perfect for a specialized cheese store. 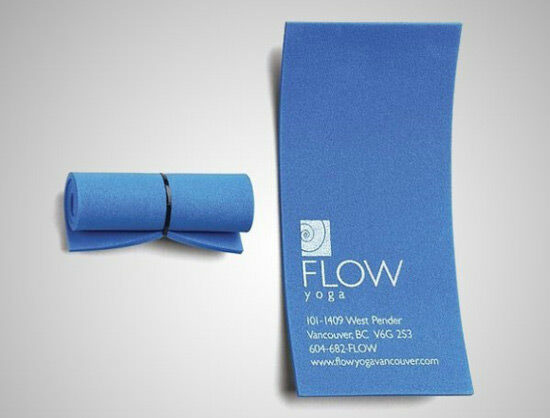 Flow Yoga has got a business card that is rolled up like a yoga mat. A simple but effective way to communicate what your brand is all about. 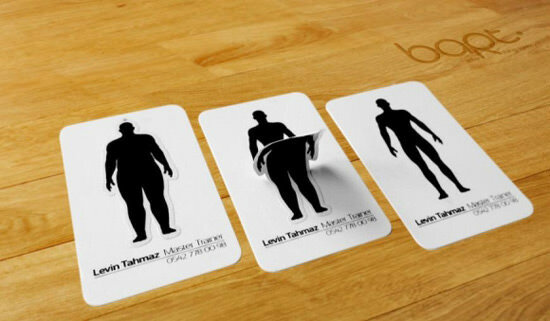 Levin Tahmaz Master Trainer is all about weight loss and getting you in shape, so the peel-off sticker on the card changing a fat man into one with a more athletic build represents the business well. The design was conceived by Bart. 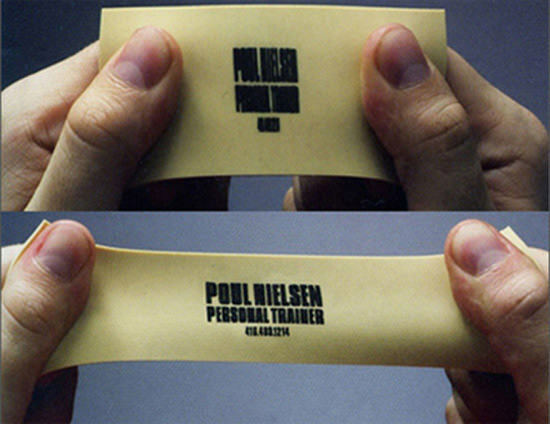 Poul Nielsen is a personal trainer and he will start training you the moment you get his business card. His contact details are printed on a rubber business card and you will have to stretch it to see the details, thus starting the workout process. 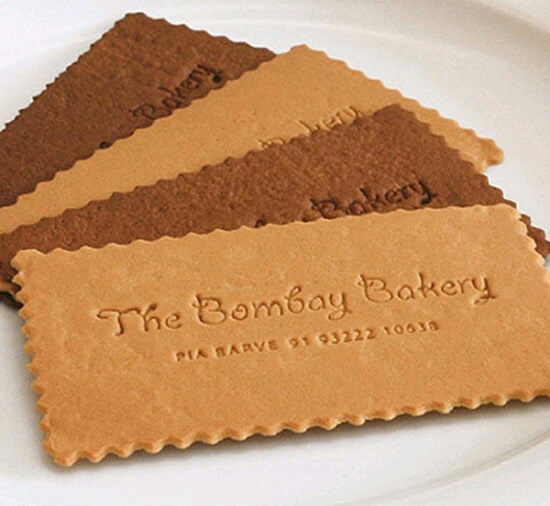 Bombay Bakery has got business cards that look like biscuits. What’s more, they are edible too! 1010tires is a high performance and affordable wheels and tires store based in Canada. 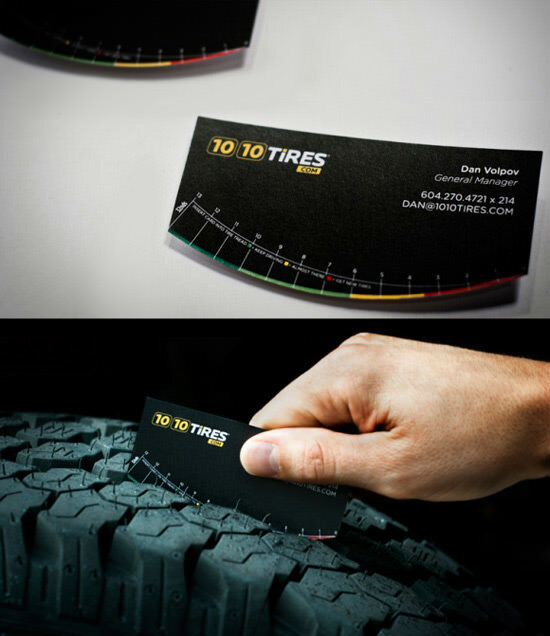 Their business card doubles as a tire gauge and allows customers to check their tire treads. A business card for a roofing company that looks like a roof when semi-folded. Schwimmer Pool Service prints their business cards on a special pH paper, which clients use to test the pH balance levels in their pools. The idea behind this design comes from doug & serge. Credit Counselling Society is a Canadian non-profit service that helps people solve debt problems and manage money better. 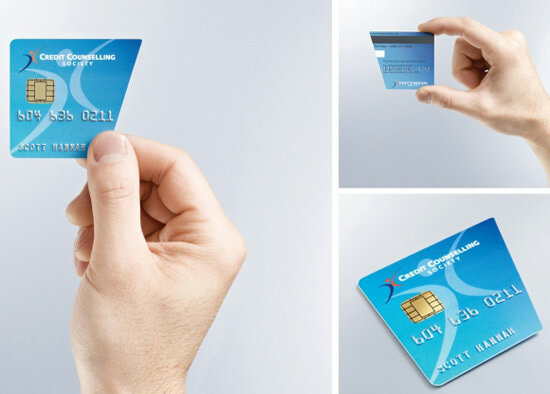 They have a business card that looks like a credit card cut in half. The design was created by the folks at Rethink. Tur & Partners, a landscape architecture firm worked with Jung von Matt to come up with this miniature garden business card. The card comes with seeds that will germinate after a couple of days, in the presence of sunlight and water. Franco Caligiuri is a financial & security investment representative that will help you buy stock when it’s low and sell your stock just before they go down. 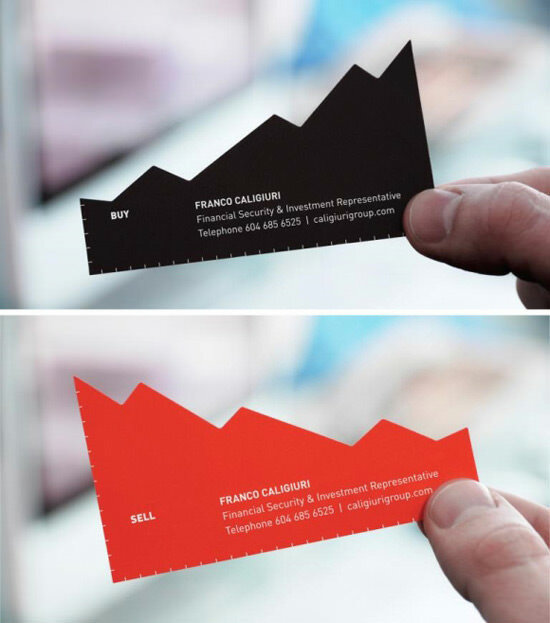 This double-sided business card conveys that message very well indeed. The design was created by Rethink. This spanner business card can help you adjust the bolts and spokes on your bike and it also has a bottle opener. This design was created by Rethink. 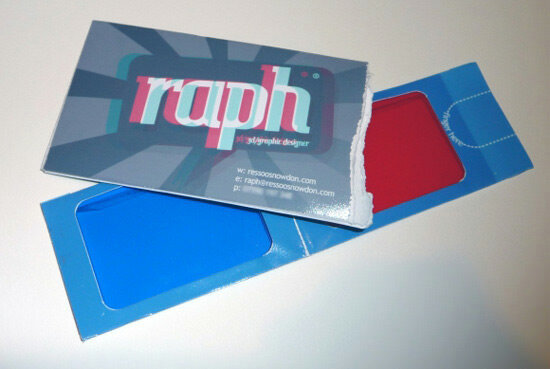 If you are a 3D designer, what better way to promote yourself than handing out business cards that also act as disposable 3D glasses? Brilliant way to show off your design skills and contact details. This minimalist business card shows how a simple email address can be used to make a business card that can highlight your website, Twitter handle, and email ID. 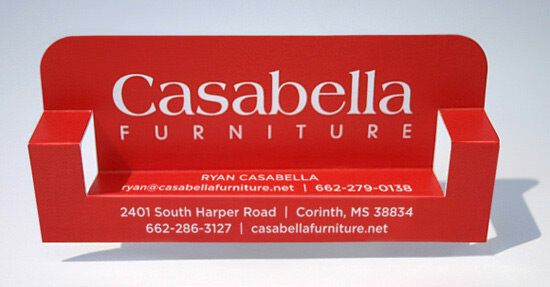 These designs are sure to give one an edge over the more traditional business cards. I am sure there are many more awesome business card designs out there that you folks might have come across, so feel free to share them with the rest of us in the comments below! Editor’s note: This post is written by Saijo George for Hongkiat.com. Saijo is a Marketing Analyst for GraphicRiver.net, a digital marketplace for materials you need for your next creative project. He keeps himself informed on the latest trends in web design and marketing, and loves coffee.